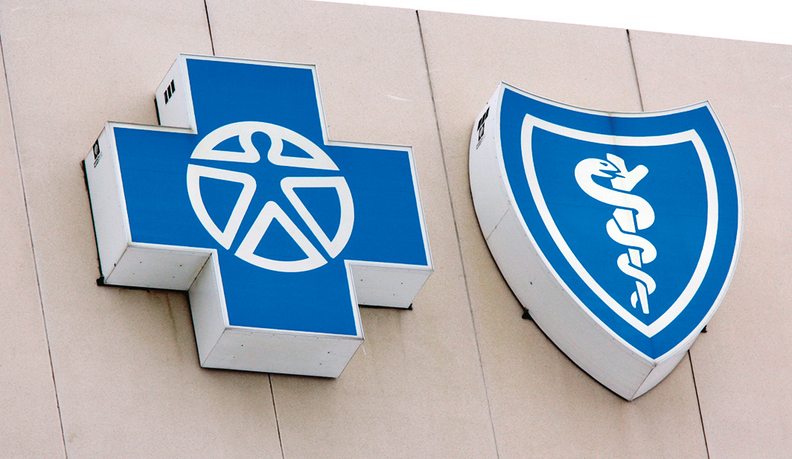 The Blue Cross Blue Shield of Michigan logos are seen on their headquarters in Detroit. A federal district judge handed Blue Cross and Blue Shield insurers a setback Thursday in a major lawsuit over their practice of creating exclusive territories, ruling the deals could directly violate antitrust law. U.S. District Judge R. David Proctor of the Northern District of Alabama found that healthcare providers and consumers showed that some of the practices of the Blue Cross and Blue Shield Association and its 36 member plans should be reviewed as a "per se" violation of federal antitrust law if the case goes to trial. The judge said the combination of the Blues plans' exclusive territories, in which they agreed not to compete, and the agreement to limit competition on non-Blues branded products, is a per se violation of the Sherman Antitrust Act. The decision is a significant legal blow for the Blues organizations and makes it easier for providers and consumers to prove that the plans impede competition by offering insurance coverage in exclusive markets. BCBSA said it would appeal the judge's decision. If it stands, Judge Proctor's ruling means the providers and consumers don't need to offer extensive economic evidence of the anticompetitive nature of the Blues organizations' conduct, lessening the need for a long and complicated trial, said Barak Richman, an expert on antitrust law at Duke University. "This makes it more likely that the Blues will settle the case," he said. The Blues had hoped Judge Proctor would look at their practices and all the circumstances surrounding them before determining during trial if they violated federal antitrust law. The decision wasn't all bad news for the Blues. Judge Proctor said there are disputed issues of fact over whether the Blues organization is a single entity that will have to be tried. If the Blues prevailed in a trial on that issue, they can't be found to have conspired to restrain trade under the law. The Blues also got a more favorable ruling on the issue of whether their collaboration to offer national insurance plans is an antitrust violation. The judge said that will require another motion with more briefing and evidence. The next step in the litigation, which has been pending for nearly six years, is deciding on certifying the class of plaintiffs. The judge will next meet with the parties on April 19 and set a schedule for the certification motion. "It's a great development in the case," said Joe Whatley, of Whatley Kallas in Birmingham, the lead attorney for the providers. "Per se wipes out all their defenses. Then the only question is how much are the damages." In a written statement, Scott Nehs, general counsel for the Blue Cross and Blue Shield Association, said the defendants would appeal and were "confident" they would prevail. He called the ruling just one step in a lengthy process. The potential class of provider plaintiffs includes most hospitals and physicians in the country, plus most other healthcare professionals who bill Blue Cross and Blue Shield plans. Whatley said the plaintiffs are prepared to move into settlement talks if the Blues organizations would agree to that. "We think it's time to complete the case, and we'll oppose their efforts to delay it more." If the plaintiffs prevail, the likely outcome is that Blues plans would be forced to compete with each other within their current state and sub-state territories, Richman said. While more insurance competition would be good for consumers, it's not clear if it would bring down premiums. "Provider concentration is much more significant in determining ultimate healthcare costs," Richman said. An edited version of this story can also be found in Modern Healthcare's April 9 print edition.